Located along Monte Vista Road between 3rd and 7th streets, Phoenix, Arizona. The original developers of Los Olivos Historic District aimed for quality construction, well-heeled buyers and stable property values. You'll probably find a grand living room, formal dining room, and detached garage on any one of these thre-quarters of an acre estates. You may find a wine cellar or tennis courts, library or guest quarters. The average square footage of a Los Olivos home means little since each is custom built and unique, but that average is 2,800 square feet, typically with 4 or 5 bedrooms and a similar number of baths. 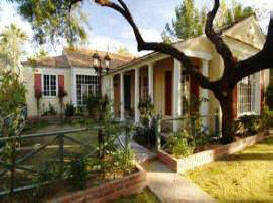 Los Olivos Historic District was a prestigious out-of-town address when these homes were custom built in the 1920's. Although the city has grown around Los Olivos over the decades and it is now central Phoenix, it hasn’t lost any of that original prestige. 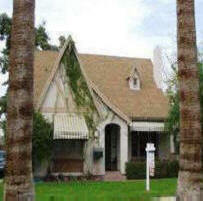 Homes rarely come on the market and, when they do, they are some of the priciest historic real estate in Phoenix. Development in Los Olivos followed predominant trends and patterns of subdivision growth in Phoenix during the early part of this period when suburban development was promoted to well-to-do families who could afford to live in the country. Built out over a 25-year period of time, the exclusive enclave developed as one of several Picturesque Neighborhoods (1911-1955) in Phoenix. Houses in Los Olivos bear a variety of romantic residential styles that represent the architectural designs popular at the time of their construction. Among the earliest houses are several Craftsman influenced bungalows which were widely popular in Phoenix during the 1910's and early 1920's. Most of the houses were built in the 1920's, however, when Period Revival styles gained favor in the high-end residential market. Los Olivos includes good examples of Spanish Eclectic, Tudor Revival, and Colonial Revival architecture from this period. The last historic-age house built in the district was built in 1955, 25 years after the previous house was completed. The Los Olivos Historic District is a small, early 20th century neighborhood in north-central Phoenix that was platted by developer Dwight B. Heard as part of a much larger 160-acre Los Olivos Subdivision in 1906. Heard named his subdivision for the olive trees that still grace the streetscape along Monte Vista Road. At 160-acres, Heard's residential subdivision was the largest of Phoenix's early home site plats. The original subdivision stretched from McDowell Road on the south, to Oak Street on the north, and from Central Avenue on the east to Cave Creek Road (7th Street) on the west; the tract lay just beyond the city's northern limits. Slow sales proved that there were few buyers for such commodious, and relatively expensive, lots in the first decade of the Twentieth Century. In 1909, Heard re-subdivided his 160-acre tract to create more affordable building sites suited to a broader clientele. In doing so, he cut most of the thirty-two original lots in half, creating 54 smaller lots. Coronado Road and Monte Vista Road were added at that time to access the new lots. In 1911, Heard carved six one-acre lots from the 40-acre southwest portion of the development. The lots fronted onto Alvarado Road, a north-south street set between Central Avenue and 3rd Street. From the outset, Heard embarked on an energetic advertising campaign to attract affluent buyers to his development. A 1911 newspaper ad for Los Olivos was typical of his efforts. Prospective buyers were assured that the subdivision was easily the foremost (of many fine neighborhoods) and that the houses would be the most modern available. Heard drew an almost idyllic portrait of the former farmland now platted into residential lots. The development boasted four miles of palm trees and a mild slope that provided views of the valley and allowed for irrigation. Heard claimed that Central Avenue, paved with macadam and oil, was one of the most delightful drives in the west and that Los Olivos offered the comfort and freedom of the country with all the conveniences of the city. Such amenities included city water, electricity, telephone service, and electric streetcars. Although the subdivision lay outside the city limits, about a mile from downtown Phoenix, Heard's advertisements assured prospective home buyers that they were only a few minutes from the business district via the Indian School streetcar line. The line followed 3rd Street, which separated the subdivision into east-west halves, thus affording good streetcar access to downtown throughout the neighborhood. Heard sought to protect both the value of his subdivision and the investments of his clients by, restricting the type and quality of construction within the tract. He promoted the subdivision as having restrictions; to assure a continuation of improvement in every way. Buildings of any undesirable character were prohibited and minimum building costs were mandated to set property values and attract status-conscious buyers. Building costs reflected the desirability of certain streets. For example, houses fronting onto Central Avenue were required to cost at least $6,000 while those on Monte Vista Road were less restrictive with a minimum cost of $3,500 apiece. Deed restrictions dictated the locations of houses, garages, and stables relative to the street, as well as the number of buildings on each site. Such restraints prevented unsightly streetscapes and maintained property values. Amenities and restrictions, coupled with significant growth in the early 1910's, following the completion of the Salt River Project, helped spur development in Los Olivos. Twenty-six of the now sixty lots had sold by 1911. In 1913, Heard re-platted the subdivision again, creating eight lots along Monte Vista Road and two lots immediately to the north. The new plat was called Los Olivos Resubdivided. The current Los Olivos Historic District on Monte Vista Road is part of this early resubdivision. Heard intended Monte Vista Road to be a residential haven with large lots, quality construction, sidewalks, and tree-lined streets. The present Los Olivos Historic District is one of the few sections of the original Los Olivos Subdivision that maintains its plat from the first period of construction (1911-1915). It is the only part of the original Los Olivos Resubdivided plat that was not further subdivided in the 1920's and which remains entirely residential. The rest of Heard's 160-acre subdivision sustained numerous resubdivisions throughout the 1920's as Phoenix grew, both in size and in population.